Whether you’re starting a new tool collection or paring down your rusty old gear and modernizing your setup, we’ve got two tools that you absolutely need to check out. First, the Kusonkey Professional Universal Socket replaces an entire socket wrench set and it only costs $9.99. It features a brilliant design with retractable metal pins, so it will work with any nut or bolt between 7mm and 19mm. 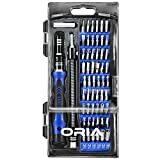 Then check out the ORIA 56-in-1 Magnetic Screwdriver Kit. 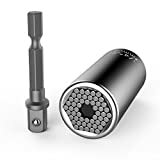 As the name suggests, it’s 56 different screwdrivers in one, and it also has a few extra accessories like a flexible shaft that helps you tighten or loosen screws in hard to reach places. Use the coupon code ORBGHA71 at checkout and you’ll get it for just $14.07!